The modified sweetheart front neckline frames the heavily beaded and embroidered bodice. 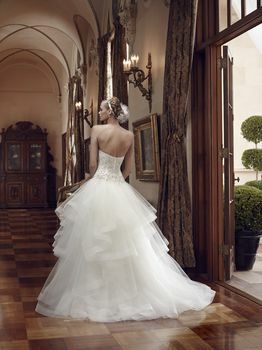 The entire strapless neckline is trimmed in delicate rhinestones. Each layer of the full tulle skirt is trimmed in horsehair to provide structure and texture, giving the skirt a light airy feel.